Browning Xtreme Tracker Pro Over Trousers. 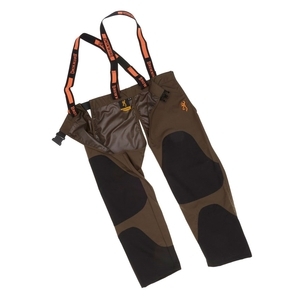 Waterproof overtrousers, recommended for wet weather big game hunting. Hydura™ is a fabric made from ultra-resistant polyamide fibres. Its weave and the fibres’ special treatment give extra resistance to abrasion, whilst keeping them sufficiently flexible and lightweight for maximum comfort at the same time. Well impressed with the Quality and finish only to be expected from Browning.